1. Experienced Vegas: I attended my first Tradeshow for work this year: PTC’s PlanetPTC Live show in Las Vegas where I ran the booth, talked to prospects, and various other marketing-person tasks. That trip was my first time in Vegas. I also rode in a cab for the first time. I know, so sheltered, right?! The Fishbowl Booth in Vegas! 2. 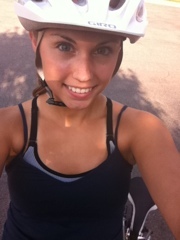 Ran 10 miles… at one time: Big thanks to Josh for this one because he convinced me to do it! Being new to running this year I didn’t think I could run 10 miles. Now I know I can, and I’ve even started looking at marathons for next year. I’ve come a long way since the kid that dreaded running the mile in PE! 3. Discovered Stand Up Paddleboarding: So much fun! Stand Up Paddleboarding is like a big surfboard that you stand up on and paddle with a long oar. It is easy to learn and great core work. For those in Minneapolis, Lake Calhoun rents them at the same rental station as the canoes and kayaks. Josh and I on Stand Up Paddleboards. 4. Tried to Wake surf: I tried to wakesurf. I couldn’t actually get up, but I tried. 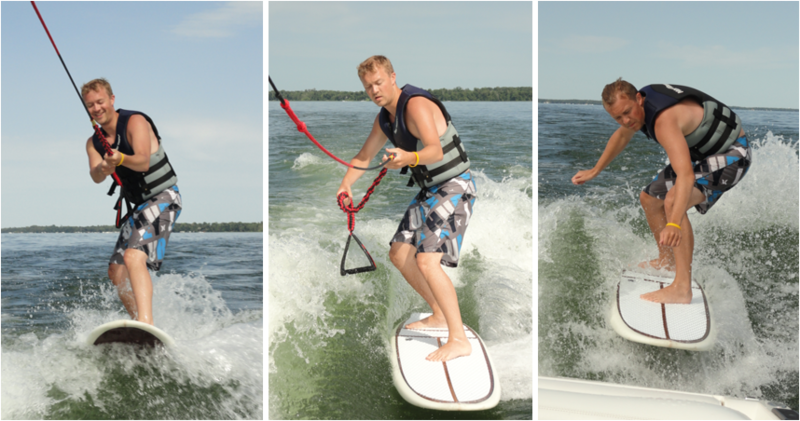 Josh, however, rocked the wake surfing! We’d never even heard of it before this summer, but our wonderful friends Libby and Caleb introduced us to the awesomeness! It’s really fun to watch. You basically surf on the wake of a boat and when you get the hang of it you don’t need to hold the rope, the boat propels you. Because the surfer is only 5-10 feet behind the boat you can talk to them and see them a lot better than skiing/wakeboarding which makes it that much better for those riding along. Josh rocking the wake surfing! 5. Ate at Zorbaz :This one makes the list because it was pretty amusing. Libby told me, “we’re thinking Zorbas on the lake for lunch” to which I replied, “I’ve never had a Zorbas, but they sound tasty.” Who knew? Zorbas is not a food, it’s a restaurant chain, but it was tasty all the same. And now I have eaten there. 6. Pitched my own Tent: This wasn’t the first time I’ve helped pitch a tent, but it was Josh and my first time using our own tent that we got as a wedding gift last October, and setting it up ourselves and being our own little family at the group camping trips. At Fourth of July we were able to lie in the tent with the flap rolled open and watch the fireworks over the lake. It was so much fun and we picked a great tent because it was really easy to set up and kept us dry through the downpours. Our tent at Fourth of July! 7. Rode a bike “clipped in”: I got “clipless” pedals in July and they are awesome, except for the part where I have tipped over 3 times since installing them. (All of these tumbles were on my old bike. Fingers crossed, I haven’t tipped the new one yet.) Two of times I fell were within one week of each other and I had lovely bruises on both hips. Me and the clipless pedals have had a rocky start to our journey together, but I’m optimistic… and a big fan of the added efficiency! Try anything cool this summer? I’d love to hear. Leave me a comment or share a link. Take photos of your favorite recipes. I used my phone, but you can use a standard digital camera for the same results. Taking pictures prevents the hassle of typing in recipes by hand and preserves the nostalgic look of handwritten, well-used recipies. Since I took the pictures on my phone I used to Shutterfly app to upload the pics, but you can just as easily log in to the web page to upload the pictures. You’ll have to log in to make the book anyway. I recommend making a new album for recipes. The Shutterfly photo book creator is really easy to use. If you’ve never used it there are online help and chat options. I have shared my book, so if you want to start from my colors and template use this link and choose “Make One Like This”. Otherwise, create the book as a “normal” photo book (not a recipe book since you won’t be typing the recipes in, and therefore won’t need that much room to type). I made a soft-cover 8×8 book, which for me works well. You can also apply this method to a 12×12 hard or soft cover book. Once you have a book started (whether from mine or from scratch) all you have to do is drag and drop the pictures into the book. Make sure to check the box “hide used”, that way you won’t put the same recipes in more than once. You can add titles to the pictures or leave them blank. Add a cover (you can add pictures too, if you so desire) preview you book and order. Mine came in about a week. These books make great gift ideas or easy ways to share favorite family recipes. Now cook and enjoy some true homestyle cooking! View my finished book here. Hello World! For those of you who don’t know, I’m Kim Negaard, a twenty-something, newlywed, marketing professional who likes to work out, eat out, and geek out. I live in Minneapolis, Minnesota with my wonderful husband Josh. I graduated from Bethel University last May, and now I work in product marketing at Fishbowl Solutions – a super fun software and services company offering E2.0-related solutions. This is my first blogging adventure and I am excited to see where it takes me. I’m starting this blog because I wanted a better way to keep in touch with family and friends, and because, as a geeky, social-media-loving, marketing type, I thought it was about time. In the days and months to come I hope to post stories, photos, and reviews on everything from iPhone fitness apps, to the pizzeria down the road. I hope you’ll join me for the journey.